elobeatlesforever: ELO Part II: Lynne & Bevan Move On? Hello ... Hello ... my old friends ... It's great to see you once again! The question that no journalist dared ask has finally been asked. In a recent interview featured in Classic Rock magazine [issue #205; January 2015; pages 100-101], Jeff Lynne was asked the above question on the subject of ELO Part II by interviewer Nick Hasted, with the above terse reply. And earlier this year, Martin Kinch from the ELOBF recommended Cherry Blossom Clinic web site interviewed Bev Bevan and Trevor Burton [see above] in advance of their gig at The Robin 2 on Thursday 5th June. Martin was somewhat surprised to be told by the former ELO drummer that he did not want to talk about ELO. 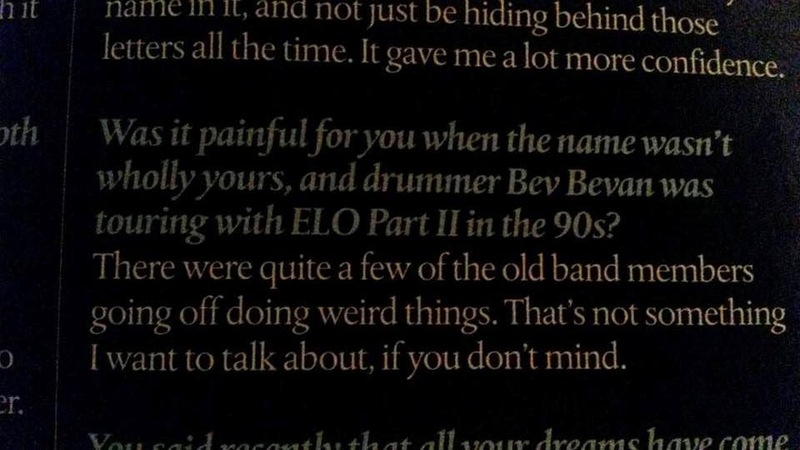 Bev also stated that, in retrospect, his forming of ELO Part II "was probably a mistake" and that he "should probably have gone out with his own band" at the time. So we have Jeff talking about ELO but not ELO Part II and Bev not talking about ELO and seemingly regretting ELO Part II, within months of each other. Has the Part II hatchet now been buried by the former band mates? Here's hoping is that this apparent truce develops into a formal reconciliation down the road. Let's also hope that Bev and Roy Wood also resolve their differences and that all three founding members of ELO are again on the same page on one day yet future. ELO Beatles Forever [ELOBF] recommends Classic Rock magazine and Cherry Blossom Clinic to those enlightened folks who enjoy the music of ELO, Jeff Lynne, Roy Wood, The Move, The Idle Race, 'Brum Beat', The Beatles and related artistes. I don't know. Bev seems a little guarded to me. I would have prefered a sincere and polite answer by Jeff, something like this: "At that time I started to work with big names in industry (Edmunds, Harrison, Petty...) as a producer, and I haven´t got so much interest about ELO, so I decided to hire the name -getting the 50 % of the profits of their first ELO P2 albums-. They gave some nice concerts with full orchestras, and made 2 albums, but nothing to do with my personal songwriting, so they finally became a mere tribute band. Giving the fact that people always asked for my songs and the fact that the name ELO often was mistakenly used in their ads, probably all this was a wrong movement". IMHO Bev probably doesn´t talk about "ELO" because he contractually can´t, both answers doesn´t mean a reconciliation at all, they are the natural result of a cold musical & comercial transaction. 'Cold musical & comercial transaction' sums it up. How much of it is down to contractual and legal reasons, how much an understandable desire for people not to rake over bad or painful memories, is something that only the people at the heart of it can answer and clearly don't wish to. It's a pity, but that's showbusiness for you (well, for all of us), and I for one don't see that situation changing.